The inscription carved some 2,600 years ago inside the world's first library in Nineveh was unequivocal: "May all the gods curse anyone who breaks, defaces, or removes this tablet with a curse that cannot be relieved, terrible and merciless as long as he lives, may they let his name, his seed be carried off from the land, and may they put his flesh in a dog's mouth." It was a warning that went unheeded 150 years ago when a British archaeological expedition excavated this ancient library, and transported its 25,000 brittle clay tablets to London as a priceless record of life in the cradle of civilization. They have remained there ever since. But now, even as Britain and America ponder military action against Iraq, archaeologists from both sides of the divide are collaborating on a remarkable project to bring the famous library of the Assyrian King Ashurbanipal, who in the 7th century BC ruled an empire stretching from Egypt to Persia, back to life on Iraqi soil. Undeterred by the rhetoric emanating from Downing Street and Washington, they are planning to send plaster casts of hundreds of the tablets to Iraq as the first step in recreating the library. The project was conceived as recently as March when six Iraqi archaeologists were granted visas to attend the Nimrod Conference in London. Once in Britain, they were anxious to know from the British Museum whether casts could be made of the tablets to serve as the centerpiece of a revived library in Mosul, northern Iraq. A month later, Dr John Curtis, keeper of the Department of the Ancient Near East at the British Museum, was invited to Baghdad where, at a seminar on the reconstruction of Babylon by Saddam Hussein, he told his Iraqi colleagues the museum was prepared to help. Despite the United Nations sanctions on Iraq, the museum says it will co-operate if permission is forthcoming from the UN. Two immediate problems with the progress of this cultural exchange remain: the British Museum is asking for money for making the copies but no monetary exchange is allowed with the Iraqi Government under the terms of UN sanctions. Secondly, the export of any replica tablets would have to be exempted from the same sanctions. Iraqi archaeologists hope that the UN's cultural body, UNESCO, will help fund the library project which has the personal seal of approval of Saddam Hussein. UNESCO has yet to comment on any Iraqi request. The decision has huge significance. The library is of immeasurable importance. 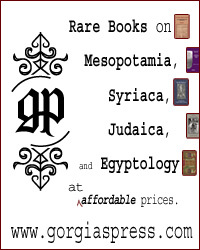 It was the first properly catalogued and systematically collated library in the ancient world. The tablets it contained, produced by scribes who were sent far and wide by the king, provided modern scholars with historical records, religious and political workings, folk tales and myths such as The Epic of Gilgamesh, part of which recounts details of a flood similar to the account given in the Book of Genesis. 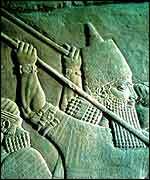 King Ashurbanipal (669-627 BC) was a great warrior, hunter and a high priest of the god Ashur. He trained as a scribe and is thought by scholars to have copied some of the works in his library himself. "This is a very exciting project," said Mudhafar Amin, head of the Iraqi interests section at the Jordanian embassy in London. "During the war in 1991, many of our archaeological treasures were looted and later turned up on sale all over the world. We are immensely proud of our culture and heritage - our home was the cradle of civilization. To recreate the library of Ashurbanipal will be a monumental achievement. The British [archaeologists] have worked in Iraq and know our country so well and know the archaeology, so they will be of great help. "We are a peace-loving nation of people who appreciate our heritage and culture but all the impressions given over here are of claims about anthrax and chemical weapons and so on. These come from the likes of American politicians who could not even find Iraq on a map. If people could actually see what Iraq is really like, they would not be so hostile. "When we communicate through music and heritage and culture and art, this is the way forward, not from the hostile impressions of politicians who know nothing about Iraq. "This [project] is about civilisation, and it is the responsibility of Britain and America to behave in a civilised way. We have shown we can co-operate on a cultural level. We should not waste that with bombs and killing and war." Dr Curtis was less political but equally enthusiastic about the Ashurbanipal Project. "Our agenda is purely a cultural one and part of our task is to maintain and improve cultural relations," he said. "The Iraqi government is interested in its cultural heritage but, since the Gulf War, there has been a lot of looting from museums and illegal excavation of artifacts. This project would help redress some of that. "At the moment, the intention is to send over about as many casts as would be practical to form the basis of an exhibition. There would probably be several hundred, certainly less than a thousand. After that, digital images could be sent so eventually the entire contents of the library is restored." Alongside the library, a Saddam [Hussein] Institute for Cuneiform Studies will be established for study of the ancient writing on the tablets. There are also plans to excavate one of the wings of the king's palace in Kuyunjik Mound, where archaeologists hope to find more tablets. The new co-operation between the British Museum and the Iraqis is part of broader attempts to keep alive cultural and artistic ties. Last year, an Italian architect visiting London told police a 4,000-year-old stone head of the goddess Medusa, illegally smuggled out of Iraq, was on sale in a local antiques shop. Regardless of the broken relations between Britain and Iraq, Scotland Yard's Art and Antiques Squad swung into action. A short time later, much to the astonishment of the delighted Iraqis, the Medusa was handed over to be sent back, a welcome restoration of heritage. 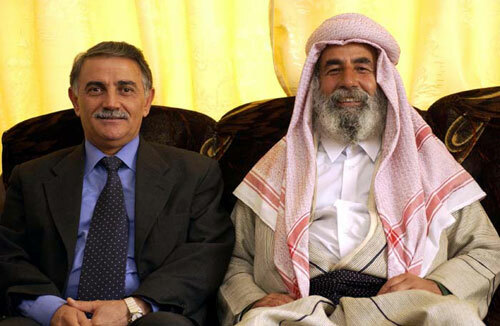 Since its coming to power in the early 1970's, the Baath Party in Iraq has meticulously worked to establish a link between the modern Iraqi Arab identity and the ancient Assyrian culture. 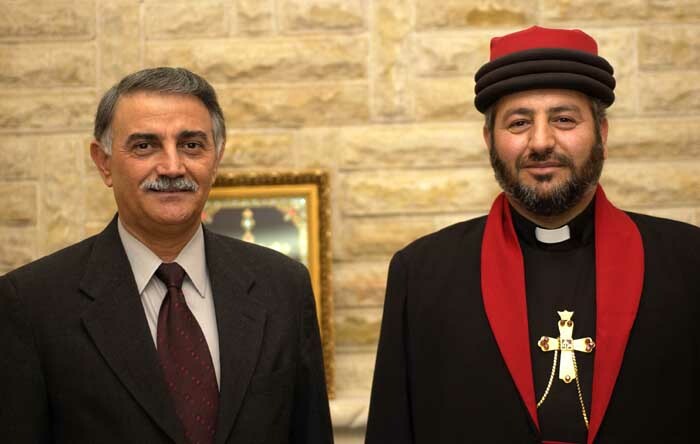 (ZNDA: Dohuk) At an informal meeting between the Bishop of the Church of the East, Bishop Isaac Yosip and the General Secretary of the Assyrian Democratic Movement (ADM), Mr. Yonadam Kanna, the topic of conversation centred not around religious topics but the very worldy issue of our ancestral land. Mr. Kanna visited His Grace, informing him of the ADM's work with the KDP to undo the problem of misappropriation of land. The Church of the East, along with the other four denominations in North Iraq, will be consulted in the process. .. it belongs to our forefathers and we don't have the right to sell it off.. " said the Bishop. While he was passionate about the problem, he confessed that he had no right to tell Assyrians what to do - rather, he was speaking from a very personal angle about his own relatives. Groups like the ADM, the Assyrian Aid Society and the Atra Project have been working diligently over the last decade to stop - and hopefully one day soon reverse - this trend. "Khenis is unbelievable!" explained Alladin Khamis. "It's an ancient Assyrian ruin sitting besides a river. 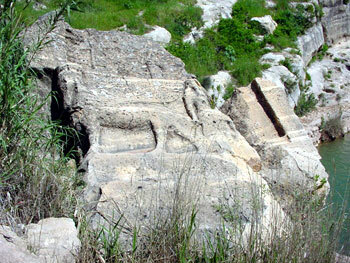 It has a huge bas relief of King Sennacherib carved into the mountain wall." I had never heard or read about Khenis before and was very curious to see this ancient Assyrian site for myself. On 30th April, 2002, Sennacherib Daniel, our two guides Nishra Youkhana and Yosip Sadeh accompanied us to this ancient Assyrian site. After a two-hour drive from Arbil we finally arrived. "There it is!" he exclaimed, as he pointed to a distant valley below us. I asked Nishra what our location was in order to get a bearing on our position. He explained that we were at a place called Khenis and that the river that passed through the valley was known as the Khosser River, a tributary of the river Tigris. This river he explained flows downstream through an Assyrian village called Jerwan, and through to Nineveh (Mosul) around 35 kilometers away. We began by traversing a long and winding mountain trail that took us to the valley floor and the river below. We approached from one side of the riverbank and crossed the river over a recently built bridge, part of a refurbishment program that had also included beautiful square pools of water, walkways and stepped rock terraces. As we approached the ruins I happened to notice that the earth on which we were walking had changed from fertile soil to some strange smooth, soft rock beneath my boots. I knelt down and touched it with my fingertips. I immediately recognised it as limestone. We continued our walk along the limestone path to a natural spring that was gushing from within an opening beneath the rocks. The spring water's source emanated from within a damp limestone cave. Nishra stepped inside and beckoned us to follow him. We slowly made our way into the dripping cave as water gushed over our boots. "Look up," he beckoned, pointing to the sunlight that beamed into the cave. "We looked up and saw what appeared to be a rectangular cut opening that led from the cave for 30 feet right up through the to the top of the hill. From the shape of the opening and the water gushing beneath our feet it was not hard to conclude that this had been an ancient Assyrian well dug out of the limestone in order to supply water to occupants living on the plateau above. We stepped out of the cave and proceeded along the trail, eager to see a close-up view of the mountain's bas reliefs. As we approached the side of the mountain wall above us we looked up and beheld a 30-foot high bas-relief of King Sennacherib wearing his religious costume standing in a position of reverence atop a dragon. Although erosion and vandalism had taken their toll, the ancient Assyrian and Babylonian gods were symbolised above his forehead. He faced what appears to be another unidentified dignitary, quite possibly his son Ashur-Nadin-Shum, who was at that time the King of Babylon. King Sennacherib is depicted drinking from a cup of wine. The relief was punctuated by neatly carved caves whose openings had been carefully carved into the bas-relief. I then stood back to take a better picture of the massive relief and leaned against, what I assumed at the time, was a massive boulder. "That's a winged bull," exclaimed Nishra. I stepped back and looked at the boulder again. He was right. Lying on its side was a colossal lamassu (human-headed-winged-bull), lying where it had fallen over 2700 years ago. It was strange to find a lamassu lying on its side 35 kilometers from the nearest ancient Assyrian capital. Lamassu were always placed in pairs and used to spiritually guard the entrances to Assyrian palaces and cities. The abandoned block depicts a lamassu as well as an attendant protective genie, bestowing a ceremonial blessing upon it. We continued along the trail and hauled our way up over more rugged hills. We then came upon the caves that had been carved into the hills. We stepped inside the caves and looked at what appeared to be roughly chiseled rooms complete with a place that had been cut out of the limestone for a bed. There were windows and rooms that were connected together. 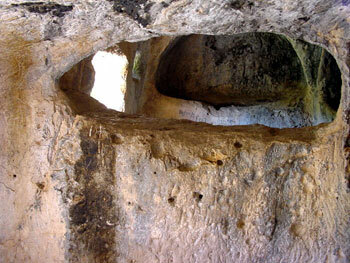 It appeared as though these had been the ancient living quarters of Assyrian occupants. After leaving the caves we followed a trail and ascended another set of steep hills to arrive at a bas-relief that had been carved into a wall. I placed my palm over the top of the cuneiform writing feeling the ancient grooves. I was deeply saddened at seeing that vandals or thieves had destroyed large parts of the relief. Perhaps this relief could possibly have recounted the annals of King Sennacherib and his campaigns against the Elamites or the Cilicians in the north. We took a number of close-up photos of the relief in order to capture in an image what may soon be lost to the world. Whilst we photographed a Kurdish government appointed watchman approached us and inquired about whom we were and what we were doing at the ancient site, explaining how it was his responsibility to guard the site against further vandalism. Our guide Nishra angered at the vandalism explained in Kurdish that we were of Assyrian descent and that it was also our duty to protect the sacred site. We continued to climb the trail until we reached the top of a lookout position. At the edge of the lookout position was the remnants of an ancient Assyrian throne. At its base sat two limestone lions, their chiseled paws and roaring mouths still visible. This was most likely a seat in which King Sennacherib sat for a complete panoramic overview of the entire site. The position also placed the King right under the 30-foot high bas-relief that had been carved into the mountainside. When asked for an explanation of what the ancient site was used for the locals and many English archaeologists describe the site as one of King Sennacherib's ancient holiday resorts. However closer examination of the site and knowledge of ancient Assyrian history paints a different picture. Ancient Assyrian history describes King Sennacherib, reigning from 704 - 681 BC as one of Assyria's greatest kings. His first order of business, upon becoming king was to shift the empire's capital from Dur-Sharrukin (Khorsabad) to Nineveh (Mosul) where he initiated one of the most ambitious building schemes ever undertaken by an Assyrian king. He set about building what he called the "Palace without rival." This involved the construction of a massive wall around the capital that was eight miles long, and had 15 major gates, 5 of which have to date been excavated.. Each of these gates required a pair of colossal lamassu (human-headed-winged-bulls) guards at each entrance. Other major infrastructure changes included a great park around the city, a botanical garden, and a zoo. All required major engineering works to provide them with water. Engineering works he ordered included the world's first aqueduct, at Jerwan, over three hundred yards long, twenty four yards wide, and containing half a million tons of rock, created to carry water over the bed of a valley. Sennacherib's Jerwan aqueduct redirected the Khosser River to Nineveh (Mosul) one of the most remarkable ancient Assyrian engineering achievements. Even today, in the Assyrian village of Jerwan there remains one ogival arch, proof that the Assyrians had been the first to master a structural technique widely assumed to have been introduced by the Romans over 400 hundred years later. After constructing the Jerwan aqueduct, Khenis a limestone deposit situated just 35 km from Nineveh would have been the ideal location for the limestone needed to construct Sennacherib's "Palace without rival." Assyrian workmen with spades, pick-axes and saws used for the cutting of stone would fashion a massive block of stone destined to become a lamassu. Workmen using heavy ropes and wooden rollers would then haul the block down to the river's edge where artisans would chisel out the rough shape of the block ensuring that it was of good enough quality for Nineveh. Any lamassu that may have been imperfect or damaged during this phase of the operation would have been abandoned by the edge of the river saving them the arduous task of transporting the 40-ton lamassu to Nineveh. This explains why one lone lamassu remains today at Khenis. The lamassu that was of good enough quality for Nineveh would then have been carefully hauled onto a raft made up of logs and floated 35 kilometers downstream over the newly built Jerwan aqueduct and onto Nineveh where it would have been unloaded. Artisans would then spend many hours performing the final painstaking tasks of detailing and polishing the piece before the mythical creature was positioned, along with a partner, at one of the 15 major entrances to Sennacherib's palace. With over 30 lamassu, protective genies as well as numerous other reliefs to construct Khenis would have required many workers, artisans along with support staff, and taken many years to supply the massive quantity of limestone needed at Nineveh. The workers would most likely have lived in the rough caves that they had hewn out themselves. It's clear that King Sennacherib himself would also have visited the site to inspect the progress of work. Before the royal visit the site would have been prepared for his visit. It is then that the massive 30 foot high bas-relief along with a throne atop it flanked by lions, as well as the other ceremonial bas-reliefs would have been prepared. With his royal tent installed, on the hills above, a bucket would have been used to draw water from the well. A chair for bathing would also have been installed for the King to bathe in the middle of the river. From an understanding of ancient Assyria's history as well as a first hand look at the site, it becomes clear that 2700 year old Khenis was not just a holiday resort that was visited by King Sennacherib. Khenis was also a quarry from which limestone was extracted to build his famous palace. In light of this understanding it becomes apparent that the Jerwan aqueduct and the Khenis quarry, far from being major project landmarks in ancient engineering, in themselves, were merely stepping stones used to reach the ultimate goal; Sennacherib's famous, "Palace without rival," at Nineveh. (ZNDA: Arbil) An international campaign to save the city of Ashur has already been launched. Ashur was the ancient Assyrian capital, which gave its name to the Assyrian Empire whose borders once stretched from the present-day Egypt to Iran. If not saved, Assyria's splendid capital will be no more in five years time. The rising waters from a dam currently under construction will inundate and destroy the city. As work on the Makhol Dam proceeds, Iraqi archaeologists want to draw the world's attention to the dangers facing the fascinating ruins of a city which for almost 2000 years served as the religious center of one of the greatest empires the world has ever known. With its empty coffers and meager resources, there is little the department can do to save Ashur. And it is hard to persuade the authorities to give up work on the dam. Iraq started the construction to store water and provide supplies for agriculture and the towns as water levels in the Tigris River have fallen drastically recently. The Makhol Dam is being built some 150 kilometers south of the northern city of Mosul, spanning the Tigris valley between the Jebel Makhol and Jebel Himrin. On completion, it is expected to create a lake which will run back for more than 35 kilometers and flood most of Ashur. The department has already written to UNESCO, reminding the international cultural organization of its obligations. It has also sent letters to international institutions in both American and Europe for help. In its messages, the department reminds the world of the archaeological losses that will result from the dam which it believes will be far greater than those caused by the Aswan High Dam in Egypt in 1970. While UNESCO and other institutions launched an international rescue operation to save Egyptian treasures threatened by inundation, a similar move in the current political situation would be impossible in Iraq. Nonetheless, Iraqi scientists say they will keep up efforts to lobby the United Nations and the world for help to save Ashur, which they have described "as the most important archaeological site in the whole of Near East." German archaeologists began excavations in Ashur as early as 1903. Since then the city has seen a stream of foreign and local excavations teams. But despite a century of extensive excavations, large areas of the city remain virtually untouched. Iraqi scientists say only a third of the 34 temples which were recorded shortly after the Babylonian invasion of 612 BC have been found. The department has drawn up plans to save the city but it says their implementation is very expensive, possibly several times more than the main Makhol Dam. One proposal calls, for example, for the construction of a cofferdam or dyke around the entire site of Ashur. But it is difficult to persuade the government to divert resources for a costly project, given the shortage of funds because of the economic problems resulting from international sanctions. (ZNDA: New York) The U.N. Security Council this week unanimously adopted a U.S.-crafted resolution to reinforce military sanctions against Iraq while at the same time eliminating most restrictions on Baghdad's trade in civilian goods. The resolution - which passed by a vote of 15 to 0 - also permits Iraq to continue exporting its oil for an additional six months. It will also set the stage for the implementation of the most extensive overhaul of U.N. sanctions against Iraq in more than five years. The vote represented a partial victory for U.S. Secretary of State Colin L. Powell, who has argued for 16 months that an overhaul of U.N. sanctions would limit Iraqi President Saddam Hussein's ability to reconstitute his chemical, biological and nuclear weapons programs while lightening the burden of Iraqi civilians enduring an 11-year-old U.N. embargo. 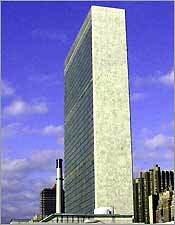 Comprehensive U.N. sanctions were imposed on Iraq in 1990, following its invasion of Kuwait. In 1996, the council established an exception to sanctions that permitted Iraq to sell oil to purchase humanitarian goods, finance the activities of U.N. weapons inspectors and pay billions in compensation to governments and businesses for losses incurred during the Persian Gulf War. The so-called oil-for-food program, which expires at the end of the month, requires renewal every six months. More than $5 billion worth of contracts are currently on hold -- about 90 percent by the United States and about 10 percent by Britain -- on grounds that the goods have a potential military use. The vote capped months of negotiations between Russia, which wants sanctions against Iraq suspended, and the United States, which is committed to removing Hussein and has threatened to use force if he doesn't allow UN arms inspectors to return. In an interview with local Detroit press, Bishop Ibrahim Ibrahim of the Chaldean Catholic Church in North America commented that "The most important thing is to relieve the people of Iraq and to lift the sanction all at once. (ZNDA: Chicago) Participants in Skokie's annual Festival of Cultures say they usually experience a few emotional moments amid the festival's otherwise light-hearted celebration of diversity, but this year they expect a special poignancy. This year, the festival will honor those who died or were wounded on Sept. 11. Under the theme of "United We Stand," the American flag will be carried onstage during the opening ceremony by Skokie police officers and firemen. In its 12th year, the festival is an extravaganza of exotic food, folk dancing, international merchandise, ethnic arts and crafts, storytelling and music from around the world. The event will be held from 11 a.m. to 9 p.m. May 18, and 11 a.m. to 7 p.m. May 19, at Oakton Park, 4701 W. Oakton St., Skokie. The opening ceremony has included a parade of national flags from the participating cultures, including the Assyrian flag, against the backdrop of an enormous American flag, and has always been moving and emotional, Kessler said. Linda Sargon, a member of the festival's executive board representing the Assyrian community, said, "This is how I think of the United States. She is a very big mother with very big arms, and she hugs us--all of us. We are all of us united under that flag." The festival's board expressed this year's theme in the following resolution, adopted Nov. 21: "In reaffirmation of our mission, with strengthened resolve, we will endeavor to set an example of unity in diversity in our daily actions and we will work together to produce the 12th Annual Festival of Cultures in Skokie." This year, Kessler expects 27,000 people will attend and learn about 25 countries or cultures: Assyria, Armenia, Bangladesh, Baha'i, China, Croatia, Cuba, Denmark, Finland, Greece, India, Ireland, Israel, Jamaica/West Indies, Japan, Korea, Norway, Mexico, Pakistan, the Philippines, Scotland, Sweden, Thailand, Turkey, and the United States. "I still have feelings for Iraq. That country isn't doing anything to anybody--it's the government," says Linda Sargon. "But I'm American," she said. "This country has been so good to me--better than my own country has been to me. "The United States of America is the hope of the whole world." To start with, let me congratulate you on the regular production of Zinda. 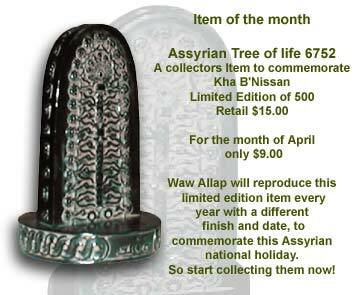 Your magazine is full of informative news and other worldwide Assyrian gems. Your efforts and unselfishness are really appreciated. May you continue in your very honourable service to your people. The point of this message is to express my special thanks for your publication of some archival material about my brother Youaw Kanna and his early efforts of the 60's to help Assyrian migration to Australia. I know Youaw was very nostalgic about those archives and felt so happy that the young generation has been able to locate these historic correspondences. 4- Helped to establish the Assyrian church in Sydney and was the prime instrument of having Rev Younan Kiwargis to come to Australia and eventually for building Mart Mariam church in Fairfield. 6- Formed the AUA and, in his capacity as the first president, he represented AUA in Tehran. 7- He helped build the present Nineveh Club and was officially opened by him. In Iraq Youaw also was active in the Assyrian Club and the school in Kirkuk. Youaw has three brothers and lives with his wife Sophia (of Habbaniya) and daughter Munya. Dear Governor Pataki, Assyrian nation has also suffered tremendously on the hands of Turks between the years of 1915-23. We lost over 750,000 people. We have tons of evidence to show the world, but unfortunately the world is somehow blind towards these facts. We were the Red Indian of the Mesopotamia and over 100 million of population and now we are scattered all over the world because few organizations in the world do not want us to be united. But we are in GOD'S name believers and believe in his power and his believers will settle us back again just like Christ has died Christ has risen Christ will come again along with his first believers the ASSYRIAN'S. This is to inform you that the website www.zindamagazine.com has been designated a Cool Site in the Netscape Open Directory "Society/Ethnicity/Assyrian/News_and_Media"
Your web site was chosen as a cool site in dmoz.org directory, you can check by visiting our web directory "Society: Ethnicity: Assyrian: News and Media". Congratulations for being one of the cool sites in this category. To view this category, click here. The Oriental Institute of the Catholic University of Louvain (Louvain-la-Neuve, Belgium) offers a paid scholarship for doctorate (3 years, full-time), as part of a program of an international research project on the tradition of the homilies of Gregory of Nazianzus in Greek and other Near-Eastern languages (mainly Syriac, Armenian, Georgian, Arabic). Scholarship for doctorate program of studies (acceptance and matriculation required in the doctoral program at U.C.L. ; a diploma of DEA is required or can be obtained during the first year of employment). - participation in the designated activities of the research group. An excellent knowledge of Greek and Syriac is necessary; competence in another language of the Christian Near East is desirable. Recruitment: international. Knowledge of French would be helpful, but participation in the activities of the research group can be accomplished in English. The dissertation (Ph.D.) may be prepared in French, English, German or Italian. For more information on the scholarship please contact: Prof Andrea Schmidt (schmidt@ori.ucl.ac.be), Tel. +32.10.474013, or Prof Bernard Coulie (coulie@ucl.ac.be), Institut Orientaliste, Place Blaise Pascal 1, B-1348 Louvain-la-Neuve, Belgium. Williams College Museum of Art Presents: "Celebrating 75 Years - Stones of Assyria: Ancient Spirits from the Palace of Ashurnasirpal II"
To celebrate its 75th anniversary year, the Williams College Museum of Art is reexamining the fascinating history of two of its oldest and most beloved works of art, the Assyrian reliefs. Stones of Assyria: Spirits from the Palace of Ashurnasirpal II, pairs the reliefs as they exist today with a computer animated rendering of the reliefs as they existed in their original 9th century b.c. context, within the Northwest Palace of Ashurnasirpal II in present-day Iraq. By combining archaeological research with technological innovation, visitors may now take a virtual tour of the palace, hear the translated cuneiform inscription etched into each relief, and view these ancient treasures. Stones of Assyria will be on view through December 2002. Inspired by the compelling history behind WCMA's ancient Assyrian reliefs -- the first ever to enter the United States -- exhibition curators joined forces with Professor Samuel Paley, Department of Classics, The University at Buffalo, State University of New York; and Learning Sites, Inc., a Williamstown-based company, to give visitors the opportunity to see inside the palace walls. The inspiration for this innovative approach to the display of ancient Assyrian art grew out of the museum's desire to not only highlight these massive reliefs, but also to impart their history. A brochure accompanying the exhibition details their place of origin; their discovery by an amateur, British archaelologist; and their momentous arrival at Williams College in 1851. This exhibition was organized by Elyse Gonzales, Special Projects Assistant, with Vivian Patterson, Curator of Collections, and Barbara Robertson, Director of Education. Academy of Sciences of Armenia has published "Corpus of Urartian Cuneiform Inscriptions" (the Corpus) by Prof. Nicolay Haroutyunyan in Russian ("Korpus Urartskikh Klonoobraznikh Nadpisey" 2001). The Corpus has hard cover, is printed on high quality paper with format 10 x 901/16. 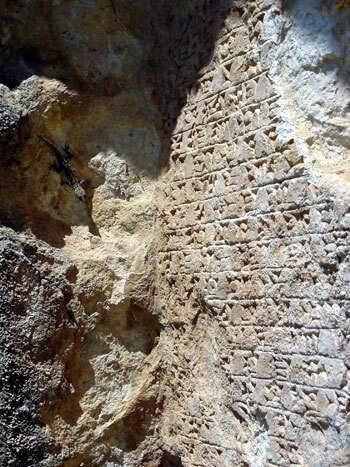 Previous Corpuses of Urartian Cuneiform Inscriptions were published more than 50 years ago. Those are by F. W. Ks nig, Handbuch der Chaldischen Inschriften, I-II, Graz, 1956-57 and by G. A. Melikishvili, Urartian Cuneiform Inscription, Moscow, 1960 (in Russian). Over this period, a large number of new materials have been found which have been published in different scientific issues but are mostly unavailable to researchers. The Corpus by Prof. Haroutyunyan includes several hundreds of new inscriptions that cannot be found in previous publications. Furthermore, it has many corrections of errors that appear in previous readings as well as recoveries of defected phrases. The author offers numerous new readings and interpretations of well-known old inscriptions. The Corpus is of great importance to Urartology as well as to Assyriology and Armenology. Religious ritual is embedded with socio-political ideologies. Nowhere is this more apparent then in the ancient Babylonian akitu or New Year festival. The akitu festival is one of the oldest recorded religious festivals in the world, celebrated for several millennia throughout ancient Mesopotamia. Yet, the akitu was more than just a religious ceremony-it acted as a political device employed by the monarchy and/or the central priesthood to ensure the supremacy of the king, the national god, and his capital city. In first millennium B.C.E. Babylonia, when the festival was at its most advanced stage it was celebrated for twelve days involving elaborate rituals, prayers, sacrifices, royal processions of the king and of the deities, recitation of the Babylonian creation epic, and the issuance of prophecies and oracles for the upcoming year-ritualistic elements which symbolized the correct religious, social, political, and economical order of Babylon. Politics and religion in ancient Babylon were irrevocably intertwined. Myths and their supportive rituals justified social institutions and legitimized rulers, whether native or foreign. Using tools of social anthropology and ritual analysis this book presents a detailed reconstruction of the festival events and its attendant rituals to demonstrate how the akitu festival became a propagandistic tool wielded by the monarchy and ruling class to promote state ideology. The akitu festival demonstrates the effectiveness of religion as a political tool. Julye Bidmead has a Ph.D. in the History and Critical Theory of Religion from Vanderbilt University. Currently on the faculty at California State University, Fresno she has previously taught at Moravian Theological Seminary, Vanderbilt University, and is a staff member of the Megiddo Expedition in Israel. (ZNDA: Sydney) Froggy.com's Karl Suleman is auctioning his luxury Princess 65 flybridge motoryacht for an estimated $2 million-plus next Saturday. The vessel will be open for inspection this week. For more information visit http://www.slatteryauctions.com.au. 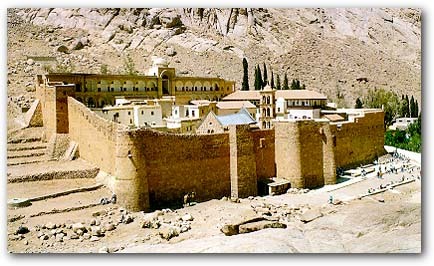 Nestled at the foot of Mount Sinai, St. Catherine's Monastery has for centuries been almost inaccessible to the outside world. Only the most devout visited, undergoing a 10-day camel trek to reach it. So rare were deliveries of essential goods that the Greek monks there struggled daily to survive. Built in 527 on the assumed site of the biblical burning bush, the fortress-like complex is the world's oldest continuously inhabited monastery: A Christian presence there can be traced back to the third century. Yet despite its isolated setting and the asceticism of its Orthodox monks, today the monastery is regarded as having one of the world's finest collections of manuscripts and icons. The ancient library - containing 5,000 early printed books, 3,500 manuscripts, and 2,000 scrolls - is of an age and diversity that only the Vatican can equal. The monastery also owns some 2,000 icons, religious artifacts, and other curios, including a silver and enamel chalice from King Charles VI of France. This item was given to the monastery in 1411 and is so unusual that the Louvre Museum in Paris recently asked to borrow it for an exhibit. The quality of the collection owes much to the arid mountain climate. The monastery's first printed editions of Plato and Homer, for example, look as if they have just come off the press; biblical fragments from the 4th century on seem untouched by passing centuries. Today, this unique collection of religious and cultural works is being slowly opened to the public. Under the watchful eye of the monastery's Archbishop Damianos, St. Catherine's is participating in three projects that will make the collection more accessible. The first stage has been to open a small, culturally rich museum inside the monastery walls. Known as the Sacred Sacristy, its nine rooms display some of the finest items of the collection: from Byzantine icons, including a 6th-century depiction of Christ that is linked to the monastery, and 9th-century parchments written in Syriac (a precursor to Arabic) to rare Slavonic prayer books and an illuminated copy of the Gospels from 995. Having pride of place though, are fragments of one of the oldest surviving Bibles: the Codex Sinaiticus, dating from the 4th century. Placed in a special glass case, with fiber-optic lighting designed by the Metropolitan Museum of Art in New York, the fragments serve as a reminder that St. Catherine's once possessed the entire manuscript. In the 19th century, however, a German academic persuaded the monks to lend him the Codex for research. It was never seen by the monks again. After passing through several eminent hands, it ended up at the British Museum. The pages currently on display were discovered in the north wall of the monastery in 1975. Because the sacristy is small and accessible only to those who make the long trip to St. Catherine's, Archbishop Damianos is also raising funds for a research center on the Greek mainland. To be built on a site an hour's drive north of Athens, the center will house digital reproductions of the entire collection. "Our goal is to digitally reproduce the entire library so everything will be available in duplicate in the study center," says Father Justin, the monastery's only American-born monk. "We also hope that the center will eventually send out CDs to scholars who need to access the texts for research purposes." Work is also under way to produce the first computer catalog of the manuscripts and a catalog of the early printed books, dating from the earliest editions to 1600. For an isolated religious community, the demands of the outside world have been great in recent years. Not only are scholars keen to access the collection, but a growing number of tourists are also dropping in. Each weekday morning, tour buses take the three-hour drive from the Red Sea resort of Sharm el-Sheikh to Mt. Sinai. As many as 1,000 people visit in a single day. For the 25 resident monks, however, communion with God remains paramount. "All of the manuscripts and icons and other ecclesiastical treasures here were created for use in the services, or to inspire the monks in their spiritual dedication," Father Justin says. "They remain in that context, which gives everything an added significance. It is still a living community, with the daily cycle of services, time for reading, and prayer." Balancing devotion and self-denial with the demands of the modern world is the challenge for the monastery. But so far, there has been no upsetting St. Catherine's way of life, one that has stretched across the ages. "It's a scene few Westerners have witnessed, but as my guests you will both be able to come and photograph a Yezidi New Year," explained Mr. Yonadam Kanna, General Secretary of the Assyrian Democratic Movement (ADM). This would be the opportunity of a life-time, we thought as we drove to the Yezidi sacred worshipping place, the Lalesh temple, spiritual centre of the world's Yezidis. Usually held at the Lalesh temple, last minute changes meant that this year's New Year celebrations would be held in Prince Khayri Beg's hall only about two kilometres from the No-fly Zone and Saddam's rule. The Yezidis follow the old calendar, and this year, their New Year Celebration was set for the 17th of April. .sharing a unique, common heritage. We arrived to the warm greeting of a Yezidi welcoming committee. After customarily removing our shoes, we entered the new hall, the door of which was adorned by a Diqna d'Neesan ("Nissan's Beard", a bunch of red flowers fixed by mud and hung around doorways, representing the coming of spring - a custom shared by the Yezidis and Assyrians). Refreshments and traditional black coffee were served. One of the first images to stand out was a beautiful hand-painted Yezidi symbol of worship, the peacock, a highly revered symbol of god. 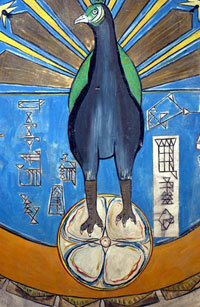 Most striking of all was that the peacock holds in its talons an Assyrian flag. On either side of the flag is ancient Assyrian cuneiform writing. Ms Christine Bird, a writer and editor from New York and author of the book on Iranian culture Neither East nor West, was also invited to the celebration. Ms Bird is traveling throughout the Kurdish and Yezidi villages of North Iraq, gathering material for her new book on Kurds. She was surprised to see Assyrians and learn of their strong connection to the motherland and their ancient ties to the Yezidi culture and heritage. "I wasn't aware of the number of religions and cultures present in this region," she said, as a heavy Yezidi headdress was carefully balanced on her head by the Prince. 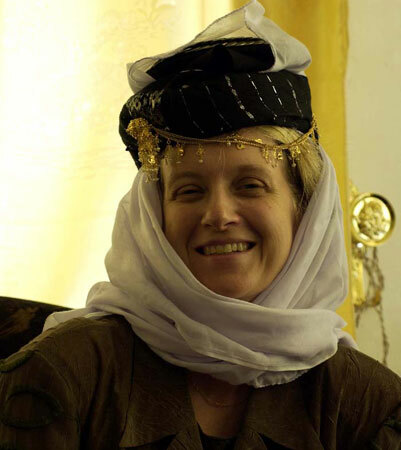 Writer/editor Christine Bird donning the traditional Yezidi headdress. Prince of the Yezidies Khayri Beg represents a direct link to the ancient Assyrian religion and beliefs; coloured hard-boiled eggs are used byYezidis as a symbol of the coming of spring and the new year. 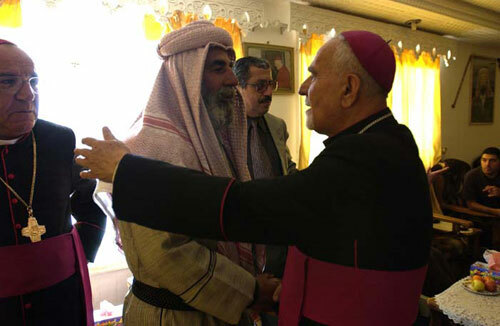 To his left sat the ex-bishop of the Chaldeans in North Iraq, Bishop Hanna Qullo, representing the Christian religion. To a Christian the eggs symbolise Christ's resurrection. To his left sat Mr. Kanna, an Assyrian representative in the Regional Kurdish Parliament. 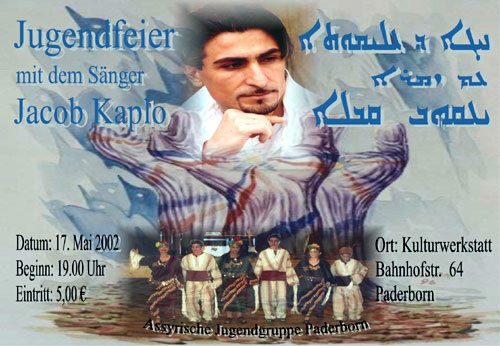 He portrays a new breed of secular Assyrian leaders who has a deep understanding of all our identities and religions. To the secular Assyrian, the eggs represent the resurrection of Tammuz from the Netherworld and the coming of spring. After the breaking of the eggs, we entered an old, dark food hall, very simple and austere in its design. We all sat down to dine in a centuries-old manner - not so easy for us "Westerners"! 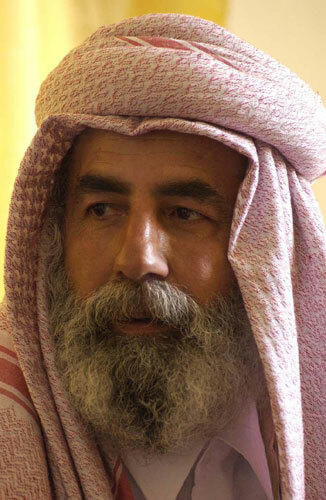 We will report on other activities by our brothers the Yezidis in the months to come. King Essarhadon appoints his son, Ashurbanipal, to be the ruler of the Assyrian Empire. Ashurbanipal's half-brother, Shamash-shum-ukin, is appointed crown-prince of Babylonia, acting under Ashurbanipal. 18 years later Shamash-shum-ukin revolts against Ashurbanipal. The revolt, strengthened by the Aramean-Babylonian-Arab alliance, is beaten by Ashurbanipal's army and Shamash-shum-ukin commits suicide. Between 1849 and 1851 Sir Henry Layard and Hurmozd Rassam unearth remains of the great palace and library of Ashurbanipal in Ninevah. Visit the Assyrian Exhibition Tent both Saturday & Sunday all Day presented by Midwest region of the Assyrian American National Federation.